There’s always been a magic about a river trip – and you can getaway to the magic of whitewater rafting on the Lehigh River. Jim Thorpe River Adventures is close to home, likely only one tank of gas away – and probably a DayTrip from where you live. The Lehigh River Gorge is a magical place. If you’ve never been here, you are missing out of one of the local wonders of nature. 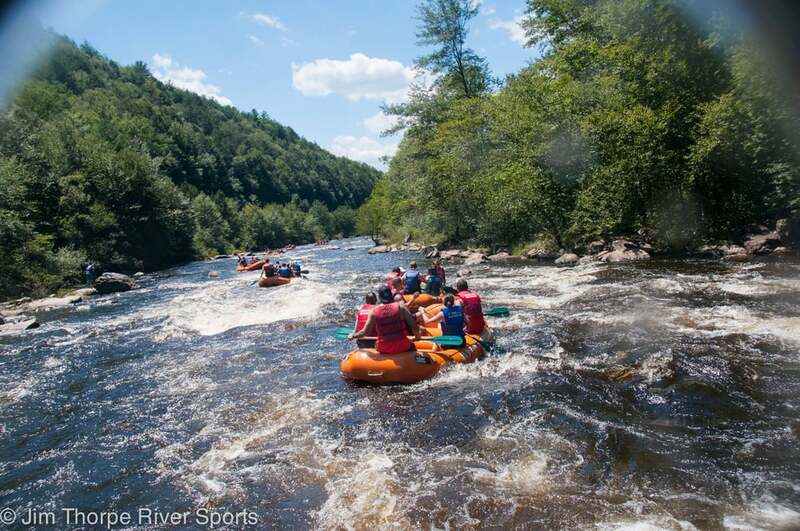 The Lehigh River is most famous for its miles of pristine whitewater, but its also home to all kinds of outdoor sports like kayaking, mountain biking, and hiking. 10 years ago the Lehigh River had great whitewater only in March, April, May, June, and several days in the fall. Things have changed for the better – and the warmer! Now WARM WEATHER WHITEWATER lies less than 90 miles from the heart of Philadelphia and less than 2 hours from Midtown Manhattan! We’re talkin’ REAL whitewater, outdoors thrills and breathtaking scenery during the summer months of May, June, July, August, and September. You can’t drive your cool SUV on the roads along the Lehigh Gorge – none exist – so you have to get with Mother Nature and paddle, bike, or hike through it! The surrounding mountains and walls of the Lehigh Gorge rise up to 900 feet over your head. This provides for jaw-dropping views of nature, complete with waterfalls, hawks, great blue herons, and regular sightings of bald eagles… how cool is that? This trip is perfect for adventurous people who are relatively fit, and kids 8 years old and up are welcome. Do you like getting your heart rate up a little bit? Enjoy a little adrenaline in your life? Enjoy the Class 2-3 rapids through the Lehigh Gorge State Park! You won’t believe the breathtaking beauty of the Lehigh Gorge State Park until you see it for yourself. Section 2 (BigTime Whitewater) – 12.8 miles long – This section starts at Rockport. In one minute you’re in Entrance Rapid – you’re paddling hard and laughing your head off right away in the big waves here. Bounce around Pinball Rock, and then thread the Eye of the Needle. Shoot past Drakes Creek and Dragon Lady Rock. In a few minutes you paddle through White Falls, then Mile-Long Rapid. Hold your breath for the ride through Bridal Veil. Sneak past Flipper Rock and choose the left or right in Double Barrel. The easy way through Hurry Right is obvious, but the middle or left side is crazy fun. The well-known Pipeline Rapid starts with an up-close and personal scrape with 45-Minute Rock, then you crash through the big waves below into Boulder Garden, Sea of Rocks, and the finale – Snaggletooth. Soon you float up to the Glen Onoko Takeout, out of breath but smiling from ear to ear. This stretch is known for longer rapids and the taller walls of the Lehigh Gorge. We call it BigTime Whitewater because it’s the most challenging whitewater rafting trip we offer… and the Lehigh Gorge State Park is where it all happens. This unique park is surely one of the gems of the Pennsylvania State Park system. Thrill yourself with a real whitewater rafting trip in outdoor scenery that will blow your mind. 900-foot canyon walls tower over your head at times – it’s awesome. This trip is perfect for adventurous people who are relatively fit, and kids 8 years old and up are welcome. Do you like getting your heart rate up a little bit? Enjoy a little adrenaline in your life? Then you know what you have to do… choose our BigTime Whitewater Rafting Trip weekends from May through Labor Day. We have wet suits available for rent, or you may bring your own! Wet suits are required by PA State Park Regulations through the end of April – and they make things more comfortable any time! * Group Leaders who reserve 15 seats get the benefit of one person rafting with us for FREE! For 30 seats, two person raft for FREE! Not to be combined with other offers. • Aqua socks, water shoes, booties, or old sneakers are fine. Hard soled shoes, Flop-Flops, or open-back sandals are not a good idea and aren’t permitted! • Eyeglass straps (Very important for those that wear glasses). • Fleece top, synthetic or woolen sweater. Anything but cotton! • Hat with a visor. • From March to June, wear something synthetic, polypropylene, wool or spandex for extra warmth. Do Not wear cotton! • Windbreaker of any kind. • Wetsuit (Mandatory through April. Can be rented for weekend OR bring your own OR rent from a local dive shop). • Any foods that you need for a specialized diet. We will provide a waterproof container for your lunch. • PLEASE do not bring glass containers of any kind, and alcoholic beverages and illegal drugs are obviously prohibited at any time due to PA State Park regulations and laws. • No large coolers will be permitted on rafts!! Lunches available for purchase. You can either bring your own lunch along OR you can order a great lunch from us! Our Box Lunches must be ordered at the time of your reservation for $9.00.There are ABSOLUTELY NO REFUNDS or rain-checks offered on food cancellations made within 24 hours or due to no-shows the day of your trip. Rafting is so much fun that it is immediately restorative. You’ll come home maybe a little tired from all the physical activity, but refreshed and fired up in a way that will surprise you. It is a privilege to put together a company of people, rafts, paddles, trucks, buses, and gear to be able to provide that professional river rafting experience to our guests. We do our best to make this natural, outdoor adventure sport as safe as possible with the highest quality people. The Lehigh River is definitely not an amusement park – it is a natural and wild environment. We work hard at our job so you go home with wonderful memories for a lifetime. The owners are very experienced and well-prepared. Our river guides spend a lot of time training on the river…they also have magnetic, fun personalities. They are truly professionals. Our office manager and staff are wonderful people, always pleasant and ready when you are to help you choose a river rafting experience that is best for you. Our truck crew members – hard-working’ guys that inflate and deflate your raft, will have your raft waiting for you with a smile. So much goes into having a smooth-running operation that provides you with an exceptionally great experience in a raft. We take very seriously the trust our guests have in us as a professional outfitter. We love having fun at what we do! And… we love being able to provide a unique and totally cool way for people to get outside in breathtaking river scenery. It’s all fun, but preparation is paramount here, in every department. You’ll meet River Guides, Truck Crew Members, Bus Drivers, and Adventure Administration staff all along the way. Each of them has prepared in their own way to provide our guests with a superior outdoor memory that lasts a lifetime. Water Releases happen every single minute of every single day! Water always flows through the Francis Walter Dam that controls the Lehigh River. If the water wasn’t’ flowing all the time aquatic life would suffer – and the trout would complain! That’s why we can confidently say we run raft trips 7 days a week all season long. The often-used term “Dam Release” refers to water released above and beyond the usual amount. When you hear us say “this is a Dam Release Weekend” that means extra water, and usually just the right amount to run all sections of the Lehigh River, including the BigTime Whitewater of the Lehigh Gorge State Park. The Army Corps of Engineers, the smart folks that protect us and regulate water levels all over these United States, are hard at work behind the scenes making all this rafting fun possible. As professional river outfitters you can trust that your friends running Jim Thorpe River Adventures watch water levels very closely. We are constantly aware of weather and environmental conditions – especially the Fun Level Conditions! We know that you trust us to make good decisions and to make things as safe as possible. Honoring that trust is important to us. The Lehigh River enjoys natural flows (what we call Base Flows) to go rafting every single day of the year. Some water levels require us to do the 8 or 10 mile section, and other higher levels allow rafters and kayakers to So you can be confident we have rafting on weekends that aren’t Dam Release Weekends. And you can be confident that if you want BigTime Whitewater Rafting, a Dam Release Weekend is one you want to choose. We’re here day in, day out, running rafting trips, kayak school classes, and having a great time. We’ll always be honest with you about the water levels you can expect! Please call us in our office if you have any questions at all. We know this can be a new experience but you have our promise that we’ll make it as easy to understand as possible. The “water releases” as they are called add to naturally occurring flows to offer higher water levels in the heat of the summer. On Water Release weekends (every two weeks from mid-May through July then every weekend until Labor Day) water is released from the dam for 12 hours starting at midnight Friday night. The same happens on Saturday night. The result is concentrated flows during the daylight hours. Section 2 (BigTime Whitewater) – 12.8 miles long – This section starts at Rockport. In one minute you’re in Entrance Rapid – you’re paddling hard and laughing your head off right away in the big waves here. Bounce around Pinball Rock, and then thread the Eye of the Needle. Shoot past Drakes Creek and Dragon Lady Rock. In a few minutes you paddle through White Falls, then Mile-Long Rapid. Hold your breath for the ride through Bridal Veil. Sneak past Flipper Rock and choose the left or right in Double Barrel. The easy way through Hurry Right is obvious, but the middle or left side is crazy fun. The well-known Pipeline Rapid starts with an up-close and personal scrape with 45-Minute Rock, then you crash through the big waves below into Boulder Garden, Sea of Rocks, and the finale – Snaggletooth. Soon you float up to the Glen Onoko Takeout, out of breath but smiling from ear to ear. This stretch is known for longer rapids and the taller walls of the Lehigh Gorge. 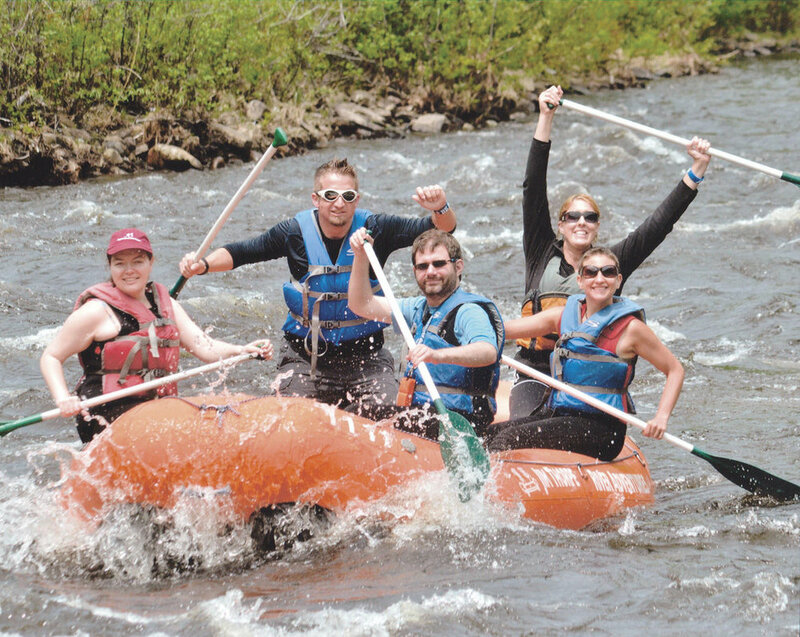 You’ll find Jim Thorpe River Adventures to be well-organized, well-trained, and a fun bunch with whom to spend the day. So get out of your suburban or city life and recharge this spring and summer! Get yourself up to the Lehigh River Gorge.